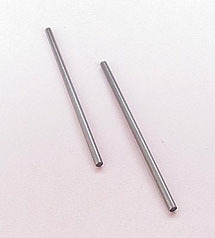 Heavy duty drill blank axle can be used for most slot cars that require an 3/32" (2.36 mm) axle that is 2.25" (52 mm) wide. Unplated 3/32 axles for those who wish to flat their own. Superior rust resistance to other unplated axles. These axles have a super hard low friction coating which will not rust. Premium 3/32 axles with precision ground gear and wheel flats, now with perfect balance with M472 Koford tires and the new Koford gears. Premium Qualifying 3/32 .066 hole hollow axle made from tubing. For those who wish to grind their own flats. Precision 3/32" (2.36 mm) Axle for cars in scale 1/24. Axle length is 75 mm. Standard steel axle is a replacement for Womps and Flexi Cars. Can be used for most slot cars that require an 1/8" axle that is 2.625" (2-5/8") wide.